The 19th annual Pierogi Fest has been named to the top 10 list of bizarre festivities compiled by global travel website TripAdvisor®. In the recently released list, Pierogi Fest, which runs July 26 to 28, is ranked among a celebrated chicken show in Nebraska and a Minnesota festival whose centerpiece is a cat-video contest. The annual Whiting festival celebrates, in a tongue in cheek manner, the region&apos;s cultural heritage and delicious home-cooked food. 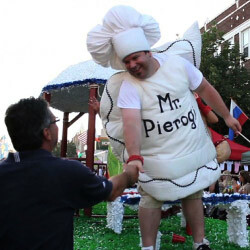 In lauding Pierogi Fest&apos;s qualifications that certify it as "wacky," TripAdvisor said, "The festivities begin with the International Polka Parade featuring the Twirling Babushka Brigade, while festival emcee Mr. Pierogi, backed by his Pieroguettes, belt out classics during the annual SongFest." "Pierogi Fest draws about 250,000 people," said Chamber of Commerce President and Festival Chairman Tom Dabertin. Dabertin added that TripAdvisor&apos;s® acknowledgement is the latest in a long list of accolades: Oprah Winfrey named it as one of her favorite things to do for five years; winner for the fifth consecutive year of the Times of Northwest Indiana&apos;s "Best Festival"; listed as one of the 25 best food festivals in North America by Saveur Magazine; featured on The Food Channel&apos;s "Great American Food Festivals", The Travel Channel, television stations throughout the United States, CNN, Germany, Slovakia, Poland, China, Australia and from throughout the Chicago area. "We have fun and incorporate that into everything we do," Dabertin said. "That&apos;s the secret to our success." Pierogi Fest has 77 food vendors, 100 arts and crafts booths, 20 specialty vendors, four entertainment stages and the undisputed, wackiest parade in the Midwest. For more information regarding this unique, one of a kind festival, contact the Whiting-Robertsdale Chamber of Commerce at 219-659-0292.